WASHINGTON -- A small gyrocopter that flew through miles of the nation's most restricted airspace before landing at the U.S. Capitol was "indistinguishable" from other non-aircraft such as a flock of birds, a kite or a balloon, the head of the Federal Aviation Administration said Wednesday. FAA Administrator Michael Huerta told a House committee that the slow-moving gyrocopter appeared as an "irregular symbol" on radar monitored by air traffic controllers. Huerta and other officials said the small, unidentified object did not pose an apparent threat before landing on the Capitol's West Lawn April 15. Forensic analysis conducted later identified a slow-moving object that traveled about 70 miles from Gettysburg, Pa., to the U.S. Capitol. 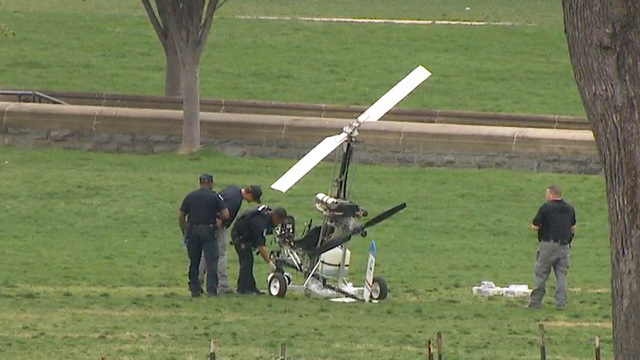 Officials now believe that was the gyrocopter. A dot representing the gyrocopter "appeared only intermittently throughout the flight," Huerta said. Capitol Police Chief Kim Dine said police were contacted just before 1 p.m. EDT by an employee of the Tampa Bay Times, who said a local man was flying a gyrocopter to the Capitol as a form of protest. No time or date information was provided regarding the flight, Dine said. The newspaper employee later identified the pilot as Douglas Hughes and said that Hughes told the newspaper he had received permission for the flight from the U.S. Secret Service and Capitol Police, Dine said. No such permission was granted by either agency, he added. The newspaper employee said Hughes was providing a live feed of the flight on his website, but officials were unable to find the feed if it existed, Dine said. At 1:21 p.m., just before the landing, a reporter approached a Capitol police officer and asked if he had seen a "helicopter" yet, Dine testified. He was told no. The vehicle landed at 1:23 p.m.
"The extremely short time frame" between a lockdown order issued after the gyrocopter was identified and the vehicle's landing made it impossible to notify members of Congress in advance, Dine said. Rep. Jason Chaffetz, R-Utah, chairman of the House Oversight Committee, has said that Hughes is "lucky to be alive" and "should have been blown out of the air." A combination of "lack of communication and some human error" by Capitol police and other officials allowed Hughes to steer his tiny aircraft across 30 miles of restricted airspace to within a few hundred feet of the Capitol before landing on the West Lawn, Chaffetz said. Chaffetz and other lawmakers want security officials to explain how they determined that the gyrocopter piloted by Hughes did not pose a threat.